Trail mix is delicious – too delicious. I’m fairly sure it’s defined as “a calorically-deceptive mixture of nuts, seeds, grains, dried fruit and other portable snacks”. A handful of trail mix is less like a snack and more like a meal. It’s designed to be a quick source of energy but there are thousands of varieties, many of which aren’t that nutritious. It can also be pretty expensive. The best solution is to make your own. I tried to strike a good balance between fat, carbs and protein. This spicy-sweet mix combines spicy peanuts with honey mustard pretzels and dates. No measurement or ingredient is absolute, modify this recipe to your liking. 1. Combine all ingredients in a large sealed bag and shake until well mixed. The grape nuts tend to sink so shake the bag around before each snack session. For best results, transfer to a bowl or napkin before eating or you will eat to much! LOVE your “more angelic” trail mix variety!! Mmmm, my kind of snack–maybe with a chocolate chip or two thrown in! ;) Okay, maybe not with the mustard flavor. Okay–I love trail mix, but I’d go for a sweet variety first! Love the idea of dates in there, Nick. This sounds great, I’ll have to try it out when I get some more of the ingredients. I’m always looking for a good trail mix. PBB’s trail mix = i can eat more crack. Yeah, why is trail mix addictive? When it comes to it (and a regretfully large number of other PB items) I’m like a dog, will not stop eating until it’s gone! This version looks fantastic Nick! I don’t care so much about the calories and fat (switched to low carb looooooong ago), so I like that this recipe doesn’t have any added sugar/syrup/honey. Thanks! I <3 regular trail mix, obviously the basic nuts and fruit… but with garbanzos, cereal and pretzels- sounds great! Ohh this does sound good. Dates huh? Never thought to use dates, but hey why not they are super good for you. This sounds like a really great combination of flavours & textures in one mix. I especially like the inclusion of honey mustard pretzels – yum! Love the picture! Thanks for sharing! The dates did if for me…. ADORE spicy peanuts. And the hot mustard pretzel nugget pieces? What is this you speak of? Are you going to get me addicted to another food now? Totally love this! Trail mix is so delicious! Minus the dates and pretzels (you’re a guy so you can handle the carbs, LOL), it looks fab! Never thought of adding roasted chickpeas to a trail mix. The savory flavoring sounds like a nice change from overly sweet trail mixes, yum! Highly addictive stuff and you’re right – calorically deceptive but oh so good. Nick, you write as though the caloric load of trail mix is a BAD thing! Some of us need all the calories we can get ;-) But I’m with you: I love making my own trail mixes filled with odds and ends from the cupboards. Like Katrina, mine almost always has chocolate chips–for energy! Just stumbled by you.. wish I had found you sooner. Great blog, holy cow, so much good stuff here. I need a day to sift through it all!! if there was such a thing as TOO delicious, this would be it :) good thing i’m roasting some pb-coated chickpeas right now!!! Mmm, this trail mix sounds fabulous. I love do-it-yourself trail mixes–you can put everything you love in there and control the amounts. Perfect! Great combo of ingredients. I like the addition of the pretzels. Great stats for your trail mix Nick, and I love the addition of honey mustard pretzels. Nice touch! Great- honey mustard pretzels are a nice addition. Love those things! I simply love trail mix. What a great combination that you have created. I will have to try this version! Yours looks much healthier than mine, I always add yogurt pretzels and sometimes…M & M’s! 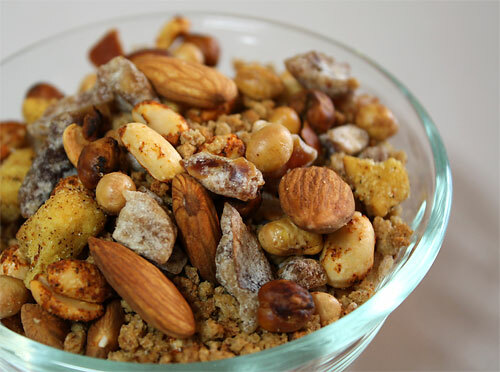 what a great spin on good old trail mix—thanks for posting Nick! I LOVE honey mustard pretzels! Nick, your comment about rice puffs (#16) reminded me of a little trick I have when making trail mix. I always eat way more than the serving size (1/4 cup, are these people serious? really?!) so I like to “dilute” it with low calorie, crunchy, puffy things, like puffed wheat or puffed brown rice or even Cheerios. That way, I can eat way more in volume for the same amount of calories. Plus, if it’s a really tasty trail mix like the one you have here, the cardboard flavor of the puffed wheat is totally disguised by the other yummy stuff. Hi, I’m writing an article for the University of Tennessee’s Spoon University chapter on different trail mix recipes and I was interested in featuring this trail mix recipe. Is it okay if I use your photo of the trail mix? I’ll credit you and link to your recipe. Hi Elisa! No problem! I’d love to see the final result. Thanks!